Facebook messenger chat app has been loaded with new features called "Mention And Reaction" features. As a Facebook messenger user, you can now mention and send reactions to someone. Recently, Facebook was rolling out new and awssome features for its messenger, and Mention and reaction happens to be the latest release among others launched for users to use. They are more committed in providing new features for users, well this is to accomplish their quest of making messenger the best IM in the world. I see the feature to be an interesting one, and I hope you wouldn't miss using them while chatting. As their user, you are now eligible to react to any single message in a thread, as you can now select between 7 different reactions in order to do so. You might like To: Download The Latest Free Premium Facebook Social Toolkit - Chrome And UC Browser Extension. => Now to add a reaction, just click and hold on any message from the messenger, and then tap to select one of the following emojis that displays: smile, love, wow, sad, angry, yes, and no. You should also note that the last two that displays there, are also interpreted as "like" & "dislike", respectively, not withstanding the fact that they are styled like a thumbs up and thumbs down. Also Read: How to Get Paid When You Monetize And Upload Videos On Facebook Social Media. When you are on a conversation between anybody, you will get to see reactions to messages right from the lower corner, there you will get to see the summary of people that reacted to your message. And by mere tapping on that, it displays the exact person that reacted to your your message. And also when someone eventually react to your message, you will get a small animation. So if you don't have Facebook messenger, open one now and get notifications on who reacted on your messages. The feature was built to show all reactions on your messages - text, stickers, videos, images, GIFs, and even on other emojis. To have it, all of these works on all conversation you are involved in and also in groups. => Talking about the other feature which is "Mention," it has to do with group chats, that aid you whenever you want to get someone's attention to your self while chating on a Facebook group. All you have to do in order to use this feature is just to type this symbol "@" followed by the first few letters of that person's name or nickname you want to get his/her attention in that group (just like that of WhatsApp feature). When you type the symbol as stated above, Facebook will display a list of people that correspond with the letter you typed, then select the person and write what you wish the person to participate in your chat. After that, the person you wanted to participate in your post will be notified that you have mentioned him or her on a post. They will get this infor via the new type of notifications, telling the selected person that you called them out specifically. 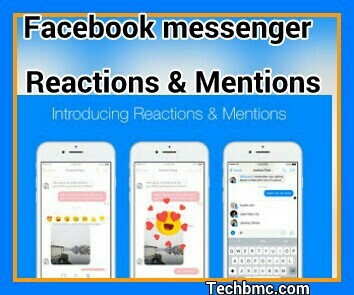 That's all about Mention and Reaction on Facebook messenger chat app. >> What's Your Stake, As Telecom Operators Intends To Block Voice and Video Calls on Whatsapp, Facebook, Skype and Viber.